Powered by MANCRAFTs newest parallel hybrid system, M/S Vision of the Fjords represents a pioneer hybrid system that exceeds market standard concerning flexibility, noise, fuel efficiency, exhaust emissions and vibration control. MANCRAFT delivers complete propulsion systems for high-speed vessels in the conventional market. MANCRAFTs core expertise is a comprehensive understanding of how the propulsion system of commercial vessels must be engineered, controlled, monitored and maintained in order to avoid downtime. The driveline in the hybrid propulsion system of the Vision of The Fjords is engineered by MANCRAFT AS and BRØDRENE AA AS with suppliers. A vessel is a hybrid if it uses more than one form of onboard energy for propulsion. Vision of The Fjords is a parallel hybrid because it can run on each form of energy independently. It is the first marine parallel hybrid of its kind due to new arrangement, composition and advanced monitoring. The system consists of two lines of MAN D2862LE422 (749 kW / 2100 rpm) diesel engine, coupling/clutch combination, electric motor and generator combination with flexible connectors on each side, advanced torque measuring equipment and monitoring for each operation modus. 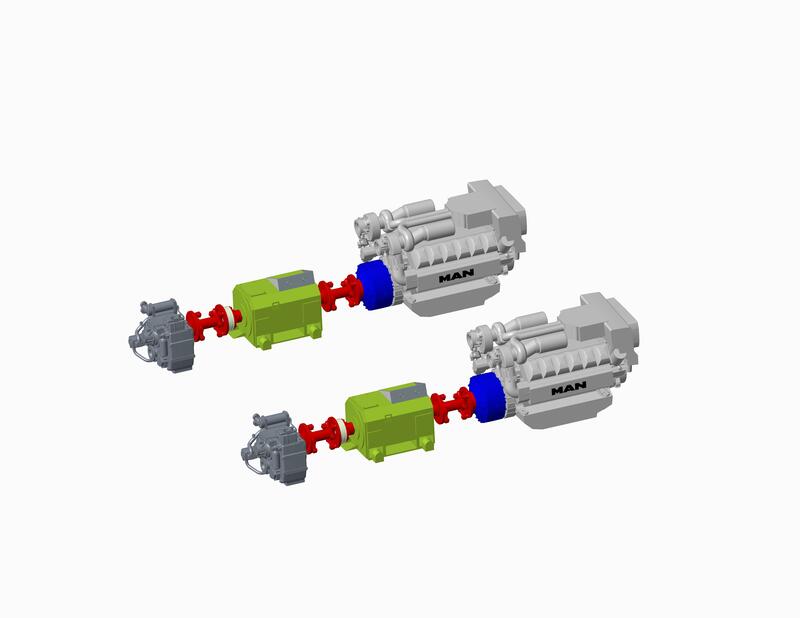 The diesel engine and the electric motor can together or independently run the propellers, ensuring system redundancy. The MAN D2862LE422 Common Rail Injection 3rd generation engine is tuned to operate in the low exhaust emissions area. The diesel engine has excess power at high speed, and therefore it can deliver excess energy to the generator batteries in the upper speed range. The electric motor is a permanent magnet synchronous motor that will act as generator or electric motor depending on operation conditions. The accumulated energy in the batteries can be utilized as the only power source, as the engine can be shut down at any time. This enables silent movement when sightseeing and in harbours as well as in normal drive conditions. The batteries alone can power the boat for up to three hours, and can be charged at port if possible. The electric motor is water cooled and very quiet-running. The el-motor has integrated shaft grounding system and isolation. Flexible links (CENTA) on each side eliminate torsion stress on the generator and vibration on board, increasing passenger comfort level. Located after the electric motor is a torque gauge. This rotating torque measuring flange works with strain gage bridges. The torque measuring signal and energy are transmitted contact-free and inductively based on Sensortelemetrie. This unique technology allows for advanced monitoring of power from the diesel engine and the electric motor, for example the amount of power that can be regenerated when slowing down. The user can easily observe which power setting or combination is appropriate. The measurement accuracy is astonishing 0.2%. The torque gauge measuring system and the hybrid propulsion system are tested and approved in good cooperation with DNV GL, fulfilling requirements according to “High Speed, Light Craft and Naval Surface Craft”. Flexibility is a key element in our system. The end user can choose the power source which benefits the operating conditions best. The system is also flexible regarding available infrastructure at port. If charging is possible, electric operation is preferred. Finally, this new hybrid system is module based, and will fit any kind of propulsion system.